It sounds like something Willy Wonka might have invented at his chocolate factory - a berry that can make everything sour taste sweet. Lemons lose their sharpness, vinegar tastes like sherry and a pint of Guinness comes to resemble chocolate milkshake. After huge success in the U.S., the so-called 'miracle fruit' is proving a big hit at parties in Britain. It is available in the form of granules which guests are invited to coat their tongues with. Anything they subsequently eat will taste much sweeter than before. The effects last up to two hours. Chas Barr, a 28-year-old from South London, gave up his job as an IT specialist to sell the West African red berries. In the past eight months, orders have soared from one or two a month to more than a thousand a week. He said most of his customers were students or those in search of something to amuse guests at a dinner party. His range is limited to freeze-dried granules and four-inch-high seedlings because the berries, which have a short shelf life, are not available in the UK. A taster pack of granules costs around £5 and a party pack for ten people fetches around £20. For the best results, Mr Barr advises: 'Take a hefty pinch of granules between the thumb and first finger, stick it on the tongue and roll it around for about a minute so that every surface of the mouth is coated. 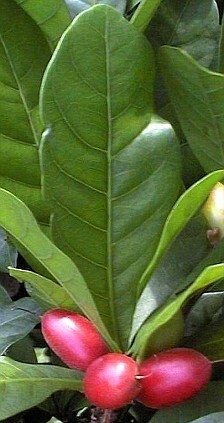 The berry, which has the Latin name Synsepalum dulcificum, contains a protein that binds to the taste buds, temporarily causing sour and bitter foods to seem sweet. Adam Morris, who supplies the berry, said it made fruit salads taste especially odd because it accentuates the contrast between the ingredients. The berries are said to be popular with cancer patients because they help mask the metallic taste in the mouth that sometimes accompanies chemotherapy. The fruit, which was identified by Western explorers in 1725, could also provide an alternative to sugar for diabetics or dieters. It is not a sweetener in itself however and its effects depend on what is eaten afterwards.